From the bright and bold to the light and airy, I can't help but swoon over the pretty palettes that I continue to see pop up in weddings and parties here lately. Still on the hunt for the perfect palette? Here’s a look at 15 of my favorites right now! I swear, if I could plan a wedding in each of these color palettes, I totally would. 1. Dusty Blue + Ivory: What's elegant and romantic and gorgeous all over? This mix of dusty blue and ivory surely is. It's a look that's effortless and I couldn't love it more. 2. Fuchsia + Gold: Warm tones like fuchsia will always have a place in my heart. And I'm hoping you can see why? And fuchsia? Well, that's probably my favorite shade of pink. Throw in glittery gold, and you'll have a palette that's nothing short of pin-worthy. 3. Sage Green + Gold: Absolutely exquisite. That's the thought that comes to mind when I see these made-for-each-other shades! Sage looks so elegant with ivory. And surprisingly, it's a palette that works wonderfully for all seasons. 4. Pink and Blue + Gold: Glittery gold looks amazing with bright blue and pink tones. Wouldn't you agree? So fun. So chic. So lovely. It's bold and beautiful and I couldn't love this more. 5. Pinks and Yellows: Vibrant, bold, and totally perfect for a bohemian affair, this palette of pinks and yellows has a really fun and playful vibe that I just can't get enough of! So totally inspiring. Yep, I'm in love. 6. Pinks and Copper: Unwilling to settle for ordinary? Why not opt for something extraordinary! Like this unexpected combination which mixes pink tones with copper. It's color palettes like this that make my heart skip a beat! 7. Coral and Gold + Black: If you're into color palettes that make a statement, then you might want to considered a vibrant palette like this one which combines bright coral with touches of black and gold. Whoa. Such a unique palette. 8. Fuchsia and Lavender + Gold: If you're a pink lover at heart, then this one is for you! 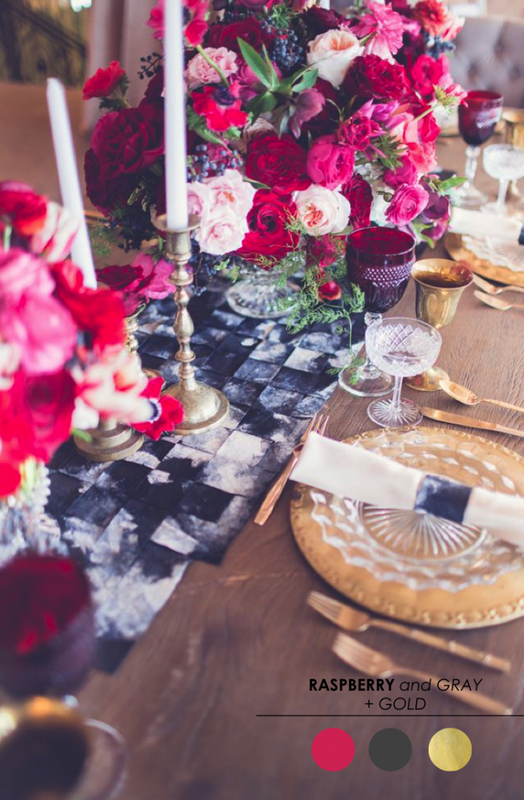 I really love the idea of mixing deep pops of pink with shimmery metallic shades like gold. Throw in a bit of romantic lavender and you'll have yourself a palette that's romance-ready! 9. Coral and Pink + Yellow: Looking to strike a balance between those bright and muted tones you love? Why not combine colors like this? Coral and pink with yellow looks amazing when styled in a very neutral space. Wouldn't you agree? You get the best of both worlds. 10. Raspberry and Gray + Gold: I have long loved this berry kissed look. And I'm thinking I might not be alone? Gold is a lovely compliment to these colors and I love how this example comes across as perfectly chic and definitely fitting for Fall. 11. 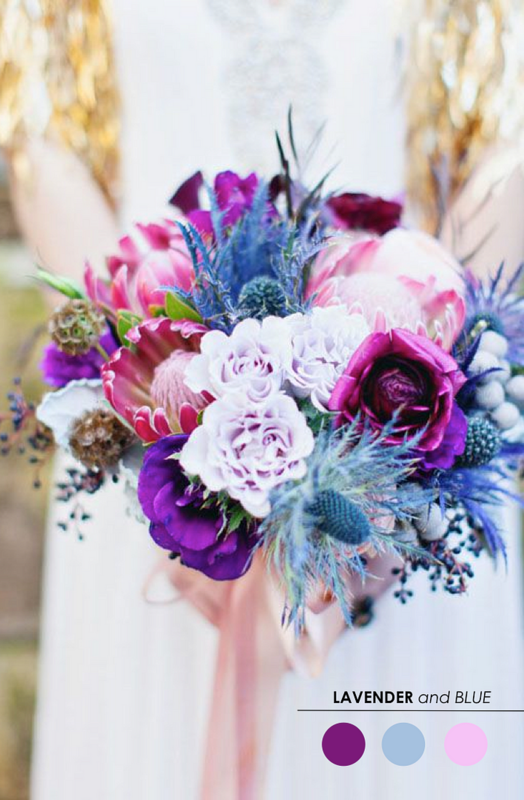 Lavender and Blue: What happens when shades of blue get mixed with lovely lavender? Say hello to this picture perfect look. It's a palette that you don't see everyday and I can't help but imagine the possibilities. 12: Mint ann Gold: If you're a mint girl at heart, then you're going to love this palette which combines mint and gold. Elegant, romantic, and all kinds of gorgeous, this is still one of my favorite mint palettes. 13. Lavender and Gold: A natural softness makes this neutral color palette of lavender tones look elegant and sophisticated. So easy to pull together and what a beautiful look it is! I like the idea of adding burlap and other natural accents throughout. 14. Raspberry and Orange + Gold Tones: What happens when shades of raspberry get mixed with these fabulous citrus shades? All kinds of vibrant prettiness. That's what! It's a mix that definitely not for color shy, but it's one that will surely make a big, bold statement. 15. Raspberry and Pink + Ivory: If you're looking for a pretty Autumn palette, then this just might be "the one." Raspberry makes the perfect compliment to these softer pinks. Wouldn't you agree? It's a rich and rustic look that will never grow old for me. So there you have it! 15 of my favorite color palettes at the moment! Did you find any old favorites? Or maybe a new palette is capturing your attention? So I'm going to go ahead and turn it over to you. Which one of these beauties is calling your name? I have a a few that I can't deny my love for. And I'm excited to hear which ones you're liking! Want to see a few more of the color palettes I love most? Be sure to head over to the color palette gallery where you're sure to find more wedding color ideas than you could ever need! 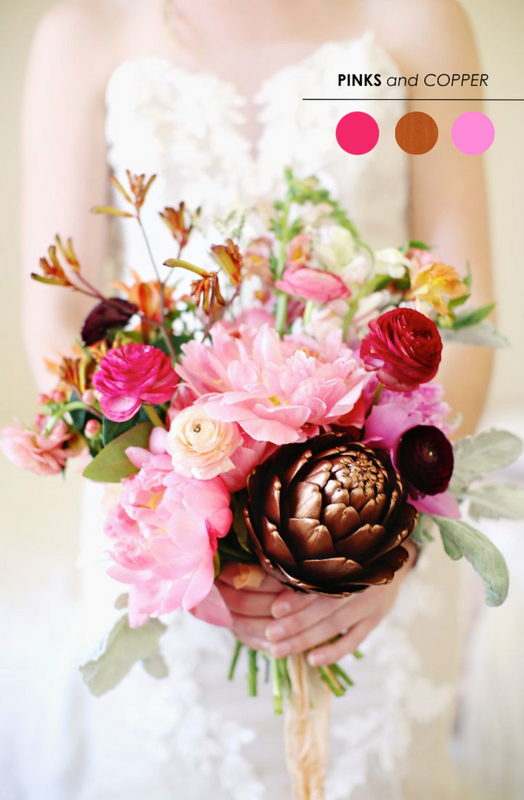 17 Comments " 15 Wedding Color Palettes to Inspire Your Style "
I love the pink and copper especially! Oh my goodness, gorgeous palette overload! Such an inspiring post. i love the ones that have gold! Very pretty. My goodness I love all of these! this is a beautiful post. loving the ones with coral. Waaay too much pretty here to ever pick from. I would want them all! Pinks and Copper is my favorite! The painted artichoke? Is. It. I LOVE the lavender and blue!! Such a pretty combination. There were actually several that I fell in love with. Thanks for sharing! So many great options to choose from. I love them! I'm pretty much floating in a cloud of wedding bliss right now. So many beautiful color palettes! Loving the sage green and gold! I think you covered pretty much all of my favorite palettes!! What a great post! Does anyone know what flowers are in the coral/gold/black colour palette? the wedding dress is very nice.i just want to say wow!!!! !